You are crazy. You know that right? Muk muk you are my inspiration. Good on ya. I will be following along with you on your journey. I’m excited for you! I look forward to your posts about the experience. That’s one of the journeys on my “someday” list. Happy hiking. That’s awesome, you just seem more at home on the trail! My friend and I walked the Camino last fall, in fact we were in a hotel in Santiago waiting on pins and needles for you to arrive in Canada!!! We have been following you since last May after hiking into Whitewater Canyon as part of our conditioning for the Camino. I had just read Cheryl Strayed’s book, but before that knew nothing of the PCT. That hike introduced us to thru hikers, the PCT and to Muk Muk! What an adventure you had and what fun it was to live vicariously through you! I have to say between my Camino and your PCT hike ending on the same day there was a such a since of loss. I was so happy that we accomplished what we set out to do but so sad that it was over too, I missed the trail for both of us!!! You have been such an inspiration as well as just plain fun to follow. You will do fine on the Camino, it will seem like a stroll compared to the PCT. As long as you can follow yellow arrows u will be fine, lol! Good luck, anxious to hear about your new adventures ! You’re so funny–dressed in your hiking clothes–going through your pack. It really brought back memories of last year. Now I can’t wait to see your pics, videos, and stories from a new trail. I love the trail so much, and I’m so excited for you to see off down a new one. My friends and I have already pulled our permits for our trips into the Sierras this summer: a usual warm-up trip to Onion Valley (Kearsarge Pass); and a week-long trip into Miter Basin, near Cottonwood Pass. Do you remember those places along the PCT? Have a fabulous adventure and please post about it!! What a wonderful and well deserved change following all of your hard work coordinating the Qasr Al Hosn Festival. We have never met, but I’ve learned a little about you through a recent read of your beautifully written and inspiring, Mexico to Canada 2013 journal. Through your inspiring and heartfelt writing, photos and videos, I’ve made a commitment to support the PCTA, provide a little TM from time-to-time and begin planning a JMT hike. I have a cabin very close to the portion of the PCT that winds it’s way through the Buck’s Lake Wilderness in the Plumas National Forest. I enjoy hiking the local trails as well as other sections of the PCT to the South. These walks are my way of recharging..I’m now looking forward to following your journey through Spain. BTW have you seen the movie called, “The Way”? It is is an American drama film directed, produced and written by Emilio Estevez, starring his father Martin Sheen. It’s an inspiring an spiritual film that takes place on a walk of the Camino de Santiago..
Best of luck and keep writing – you have a gift! Have a great trail experience on the Camino del Norte. Looking forward to reading and watching your next adventure. I leave on 4/16 for the PCT and “our” SPOT will be hiking with me. I am SO excited, and I love it that you are doing another hike! I have done the Camino from my home in Germany through Switzerland, France and Spain, changing from the Via Podiensis to the Via Tolosana while still in France, and in Spain then following the Camino Aragonés until joining the Camino Francés. Can’t wait to hear more about it, I am really giddy with excitement right now – Muk Muk is doing another trail! Yay! What a wonderful new adventure! I recently read a wonderful book called “God’s Hotel”. It is written by Victoria Sweet, a lady doctor from San Francisco, and follows her hike on this trail. But there are no bears or mountain lions or snow, right? I have a friend who has ‘done the Camino’ before so I was absolutely thrilled to read that this is your next adventure! Yay! This one is definitely on my bucket list! Well I never hear back from you, but I hope life is treating you good. I think you’ll enjoy watching “The Way.” Consider it for your flight. I know I have never meant you, but earlier this summer while browsing the internet for information on the PCT, I stumbled upon your blog and ended up following your journey. First, congratulations on the successful finish! Second, thank you. 1. Your blog posts made my job much more bearable. And 2. You inspired me to quit my job, pack my backpack, and buy a one way ticket to New Zealand where over the next six months or more, I will travel the world. If I never found your blog, I don’t think I would have ever taken the leap of faith. Your journey was truly inspiring and had an amazing impact on me. So I just wanted to say thank you and good luck on your next hike! Greetings! Came across your PCT posts last year because a good friend was thru-hiking about a week or so behind you. I walked the Via Podiensis>Via Francés to León (so far) over a couple of section trips and it has been a fantastic experience. I was planning to do the last 300km or so to Santiago and Finesterra next month, but a change in work commitments has that looking less likely. :-\ You’ll be walking in shoulder season on a less travelled Camino, but you’ll probably still be faced with a bit of a race to get a bed in a Auberge each day. This is the only aspect of the Camino in Spain that I do not particularly love. Happily I carried a tarp and sleep kit (but not my cook kit) and really enjoyed mixing up the various options for accommodations – camp, Auberge/Gite, Pension, the occasional Hotel. I met essentially no other pilgrims that planned to camp, but I personally loved doing so when I wanted to take my time during the day, to have a quiet night, or to simply keep walking more than the standard 6am-2pm window allowed – especially in Spain where the number of peregrinos was 10-fold higher than what you see in France prior to St Jean Pied-de-Port this was a welcome option to have. Also, having a long rest in the late afternoon and big dinner with other peregrinos, still allowed for the best parts of the communal Camino experience, with a lot less snoring, farting, and other dormitory staples. Some of my favorite times on the Camino were walking out of some village in the early evening – usually with a belly full of food and a head full of wine…the trail, sunset, and sunrise more or less to myself. Unless you are on a very tight budget, I wouldn’t bother with the cook kit or filter. Food is relatively cheap and unless Camino del Norte is much more sparse, you will typically pass through a village or two during the day to resupply and get water. Enjoy the local food as much as possible – an essential part of the experience in my opinion (though you probably will get tired of the bocadillas). As a seasoned thru-hiker you need little practical preparation for this walk. Perhaps just pulling together some sources of info on regional history, culture, food, etc is the most useful thing you can do to enrich the experience and provide some context to what you’ll see and do. There are many ways a cultural thru-hike is different from a wilderness thru-hike, but there is also much that I expect will be familiar – and I’m sure it will be wonderful. I am envious of your courage to go out and experience life to its fullest. I admire your zeal for life and wish I only had the freedom to do these things myself. This trip is on my bucket list though – – one day. Hey Muk Muk! 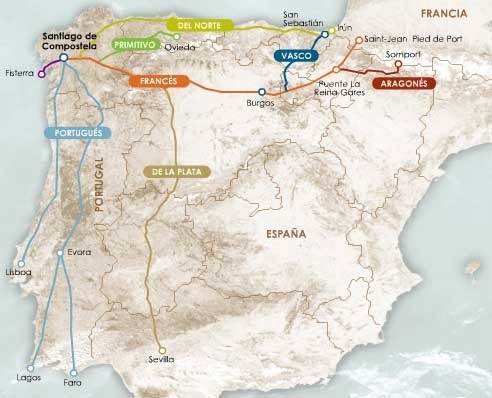 Where’s Chris filled me in on your Camino plans…the Norte is on my list for my third Camino in early 2016. I’ll be interested in hearing your thoughts…I think most thru-hikers find the Camino to be a bit disappointing…it’s not a hike…it’s not really a backpack either…it’s a walk along various paths and roads. You don’t need camp gear (though on the Norte, it might be a good idea) and you sleep in albergues and eat in bars. It’s one of the reasons a thru-hike is so intimidating to me…I’m spoiled on the Camino! Enjoy yourself and buen Camino peregrina! First off… No laughing at my tardiness in responce to this story of your (upcoming) hike . Alaska found me with little to no internet connection in early 2014. So, I am just now setting out on this journey through Spain with you. I followed every step of your PCT trip, but commented only on a few occassions due to poor internet as well. But now I have a new phone that can reply on your blog. So, it is my intention to read my way through Spain with you as if you were still on the trail. I suppose I will think of many things I simply must to add in your comment section along THE WAY, but none more important than this THANK YOU….for once again inviting us along with you. those of us who dream of walking these trails ourselves someday….you and your stories are such a sweet gift. Enough for now… I have to get back to reading. Geee I wonder what happens !? !